Does Your Dog Need Grain Free Dog Food? Dog Food Guide > Dog Food > Does Your Dog Need Grain Free Dog Food? Once upon a time, all commercial dog food was basically the same. It was made from leftovers from the (human) food industry, often including many ingredients we would consider undesirable today. It was not unusual to find meat and bone meal, animal digest, artificial sweeteners, artificial preservatives, food dyes, and high amounts of wheat and corn in most, if not all pet foods. Even cats were fed this same kind of diet. Some people think dog foods today are lousy but compared to the foods we had for dogs just 40 years ago, it is possible to buy some very good quality dog food now. The changes probably started with food allergies, food sensitivities, and grain free dog foods. Sometime in the 1970s and ‘80s, some people seem to have noticed that they had dogs that were having skin problems – insane itching, chewing, loss of hair, raw skin. All of the things that make a dog miserable and which, consequently, make a dog owner so unhappy. Vets took skin scrapings, blamed fleas, scabies, and sent the dog and owner home with expensive skin shampoos and conditioners; or loaded the dog up with prednisone. None of these things really helped the problem because, in many cases, dogs were having a reaction to the food they were eating. As a last ditch effort, vets would tell owners to cook lamb and rice for their dogs – because there was no lamb and rice dog food available at that time. Everything was beef or chicken, corn and wheat. At that time, lamb and rice were novel. Some dogs improved. It didn’t take long for pet food companies to begin to make lamb and rice dog foods. We would consider this the start of the trend toward grain free dog food. It was originally fed as an attempt to avoid certain food allergies. We can’t say for sure which companies first introduced lamb and rice dog food. It may have been Purina or it could have been Nutro. Nutro’s dog foods were the top selling foods sold through pet food retailers for a while in the 1990s. Their Adult Lamb and Rice formula dog food has been the number one lamb and rice food in the U.S. at times and their MAX formula has also been popular. FirstMate, in Canada, claims to be the first company that produced a specialty grain free food in 1995. 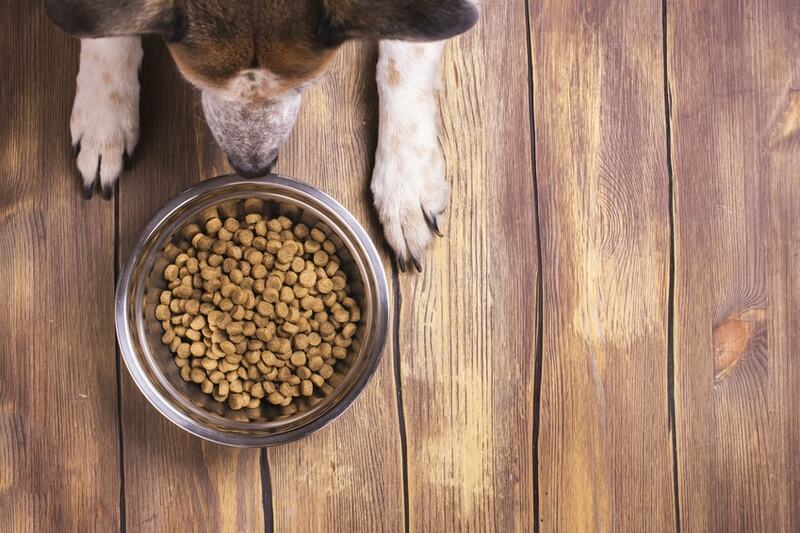 Are grain free dog foods healthier? Over the past couple of decades, grain free dog foods have become tremendously popular. Today they are often preferred to other kinds of kibbles, even for dogs that do not have any food allergies or sensitivities. People often believe that these foods have better quality ingredients; that they are lower in carbohydrates/starches than other dog foods; and that they have more protein. Not all of these things are true. It always depends on the particular dog food or brand. Veterinarians tells us that true food allergies are not common in dogs, accounting for about 10 percent of all the allergies diagnosed in dogs. They are only the third most common cause of allergies in dogs, behind flea bite allergies and inhalant allergies. However, if you’ve ever had a dog with a food allergy or a food sensitivity, you know just how awful they can be. And, if you’ve ever spent any time on a dog food message board, you would probably doubt that low percentage. There is never a shortage of dog owners with itchy dogs or dogs with gastrointestinal problems. Some people – even some veterinarians and alternative health practitioners – seem to believe that grain free dog foods are healthier for dogs because, by definition, they do not contain the glutens found in some foods with grains. Actual gluten only comes from wheat and related grains such as barley, rye, oat, and all their species and hybrids (such as spelt, kamut, and triticale). This means that corn and some other grains and cereals do not really have gluten. Terms such as “corn gluten meal” that you find listed in dog food ingredients are food industry terms but this kind of ingredient won’t behave as – or have the same effect in the gut as – a genuine wheat gluten. So, while wheat and corn are often linked in the consumer’s mind as far as dog food is concerned, these two ingredients are very different. If your dog is not allergic to wheat or corn, there is no particular reason to avoid them in small amounts in a good quality dog food. Dogs, unlike wolves, are able to metabolize the starches from these grains. Grains like wheat and corn only become a problem in dog food when they are used as filler ingredients and become a substitute for protein. They provide a lot of carbs and some plant protein. Ideally, good dog foods will have low to moderate levels of carbs, regardless of the source. You occasionally find claims that dogs can get Celiac disease, especially when discussing glutens. It is highly unlikely that dogs can suffer from Celiac disease. There has been exactly one documented case, of one family of Irish Setters in the 1990s, that seemed to spontaneously develop this condition. Celiac disease is a human genetic autoimmune disorder. However, it does seem possible that some dogs may have something similar to a non-Celiac wheat sensitivity or non-Celiac gluten sensitivity in which wheat or gluten has an adverse effect on them, producing abdominal pain, bloating, diarrhea, constipation, fatigue, joint pain, and other symptoms. Feeding your dog a grain free/gluten-free diet could be helpful in these cases. As for corn and other non-wheat grains and cereals, dogs appear to develop allergies to these ingredients the same way they do to other common dog food ingredients such as beef, dairy, chicken, lamb, fish, soy, rabbit, and so on. (Yes, lamb is now a common allergen. At one time it was a novel protein but it has been used so widely in dog food over the past 30 years that some dogs are now allergic to it.) Any ingredient which is used to a great extent in dog foods can become a common allergen. If dog food companies begin to widely use kangaroo meat in their foods, you will soon see plenty of dogs developing kangaroo allergies. These are not bad ingredients. They are just common ingredients and some dogs will have an immune system that reacts to an ingredient with enough exposure. Don’t blame the dog food companies for this. They have to use something in their foods. It’s also not a question of food quality. If your dog is allergic to chicken then it doesn’t matter if the chicken is whole, deboned, chicken meal, free-range, kept in a coop, or plays the piano. Your dog will still be allergic to the chicken. Are grain free foods better in quality? As for the issue of whether grain free dog foods are better in quality than foods that include grains, there is probably some truth in this belief, but not because the foods do not contain grains. It’s probably because grain free foods are more likely to be manufactured by some of the companies in the natural/holistic dog food niche. These small companies have positioned themselves in the market with the idea that they make better food. Some of them use “human grade” ingredients and take other steps to make sure their ingredients are high quality. Big players like Purina, Eukanuba, and Mars have been relatively late in producing grain free dog foods. The small niche companies were able to appeal to dog owners by claiming that their grain free foods were healthier and more natural for dogs. (Not all of these claims were true as people discovered with the Blue Buffalo advertising case.) To be frank, at times there has probably been some degree of elitism associated with feeding grain free foods from small niche companies which has made the foods seem more desirable to other dog owners. Today grain free dog foods are so common they have probably lost this superiority. Most dog food companies make grain free and grain-inclusive foods. It’s simply a matter of choice whether you feed your dog a grain free food or not. Some dogs can eat both grain free and grain-inclusive foods equally well while other dogs seem to do better on one or the other. There are some bigger companies that have had a big impact on the popularity of grain free dog food. Diamond’s Taste of the Wild and Kirkland Signature Nature’s Domain (sold at Costco) have been extremely popular grain free dog foods for years. They receive good ratings from various dog food reviewers and they are not quite as expensive as some of the foods from niche companies. Grain free dog foods have also been entwined with the logic behind feeding dogs a raw diet (though the two diets are not very similar). People who feed a biologically appropriate raw food diet can explain many important features of these diets. However, some people who feed kibbles have taken this concept to an extreme and emphasize high (HIGH) meat protein in the diet. There is plenty of grain bashing on the Internet as people seek out kibble that has higher and higher protein percentages – especially in grain free dog foods. To be clear: YOUR DOG IS NOT A WOLF. Your dog cannot eat the same diet that ancient wolf-dogs once ate. If you try to feed your dog this kind of diet, he will not thrive, no matter how much people may swoon over the idea of the dogs/carnivores/meat diet. If you look at the actual BARF diet for dogs, you can see that a raw food diet for dogs is more than just meat and bones. Even Orijen, a grain free dog food that promotes the “biologically appropriate” theory of feeding dogs, has reasonable dry matter percentages compared to what some people online seem to promote. Plenty of meat protein from good sources is certainly desirable for most healthy dogs. However, that’s not what you find in all grain free dog foods. If you look at the guaranteed analysis and even the dry matter analysis for some of these foods, you may believe that they have lots of protein. And they usually do. However, when you examine the ingredients you will often find that they have been loaded with plant proteins such as lentils and peas (in various forms). Many dogs are not particularly adept at digesting plant protein so the foods have lots of added enzymes and digestive products included. The meat protein content of the food may or may not be very high. Even some companies that started out using a lot of meat protein in their grain free dog foods have cut back in recent years and now include a lot of plant protein. So, if your dog is no longer digesting his grain free dog food as well as he once did, this could be the reason why. What this means is that many companies have simply substituted peas and lentils for corn and wheat in their foods. The foods are called “grain free” now, which sounds appealing, but it’s quite possible there are some low-grain dog foods that are healthier for some dogs than some grain free foods. (One low-grain food we like is Farmina.) While we think of corn and wheat as carbohydrates they are also used as plant sources of protein. The same thing is happening with peas and lentils – except peas and lentils have more plant protein than grains do. When you buy grain free dog food, make sure you read the label and look at the ingredients. You want to see several meat proteins in the first few ingredients. If the food lists peas and lentils or other plant proteins in the first few ingredients, it’s likely that you are paying (probably a lot of money) for legumes. If you are paying meat protein prices for a grain free dog food, make sure you are getting a food with a lot of meat protein. It’s also important to point out that people often believe that grain free dog foods are low in carbs but this is not always true. Grain free dog kibbles are still made using an extrusion process which means they need starch in the formula to hold the dough together. While these foods don’t use grains, they often substitute vegetables like sweet potatoes and potatoes, or they use tapioca and other starches. In many cases, these grain free dog foods have carbohydrate percentages that are every bit as high as dog foods that include grains. This is not true for every grain free food. You can find good grain free kibbles that are low in carbohydrates but don’t assume that all grain free dog foods are low in carbs just because they don’t have grains. He has a sensitivity to wheat or gluten. Otherwise, choosing a grain free dog food is a matter of choice. There are many excellent grain free dog foods today but you need to carefully read the ingredients and check the dry matter basis for the food. Avoid grain free foods that are stuffed with plant proteins. Look for foods that have plenty of meat protein. And make sure the food has low to moderate carbohydrates. You do not have to feed your dog a grain free dog food in order to feed a healthy, good quality food. There are some good grain-inclusive foods if you prefer to feed a food with grain. Just make sure that the food has smaller amounts of grains. Dogs can digest starches but you don’t want carbohydrates to be a large part of your dog’s diet. Whether you feed a grain free or grain-inclusive dog food, many dog food companies are becoming very creative with ingredients. You can find foods that use pumpkin, apples, squash, and other ingredients as carbohydrates. These ingredients are often helpful to the digestive system and provide other benefits. We aren’t just limited to grains and peas in our dog foods. Hello, I have been trying to find a dog food for my 9 year old 60lbs Female German Short-haired Pointer we had a allergy test done on her because of her itching and rash/hives and these are the results, and i am having lots of issues finding a dog food for her and i also feed my German Shepherd 10 year old 150lb male and he has hyperthyroidism the same food so need something for both of them since it is hard to feed them separately. I forgot to put Lamb on the list of things she is allergic to also.